EUCCK President Frans Hampsink (right) poses for camera with Minister Chin Dae-je of the Ministry of Information and Communication during MOU signing ceremony Feb. 9, 2006. 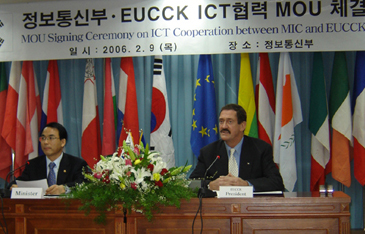 The European Union Chamber of Commerce in Korea (EUCCK, www.eucck.org) and the Ministry of Information and Communication (MIC) signed a historic MOU on Feb. 9, 2006 to enhance continual cooperation in the IT-Telecommunication field. The MOU was signed by Minister Chin Dae-je and EUCCK President Mr. Frans Hampsink, in the presence of MIC officials and leading executives from the IT and telecom industry. Among those who attended the event were Mr. Horst Kayser, President, Siemens Ltd; Mr. Kang Uchoon, President, Nokia Korea; Mr. Kim Chong Tae, President, France Telecom R&D; Mr. Alessandro Canova, Vice President, Assioma.net; Mr. Wolfgang Slawinski, Chairman, EUCCK IT & Telecoms Committee and Mr. Jee Dong Hoon, Deputy Secretary General, EUCCK. Speaking on the occasion, Minister Chin said that the agreement would facilitate the exchange of information in the area of the Information and Communication technology between the sides in order to overcome the obstacles of investment and trade. The MOU also seeks to improve cooperation between European and Korean SMEs in the area of IT-Telecommunications and to promote scientific R&D partnership between European and Korean companies. 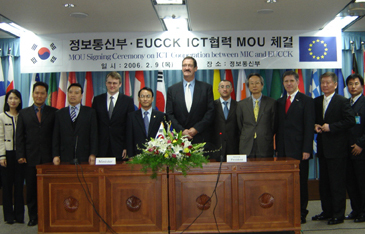 EUCCK President Frans Hampsink (center) poses with MIC Minister Chin Dae-je (to his right), and others during the MOU signing ceremony at MIC building in Seoul on Feb. 9, 2006. "We hope that cooperation in the field of the IT-Telecommunication between the MIC and EUCCK will contribute to the stimulation of entrepreneurial investment and trade by EU and Korean companies," the minister said. We understand that that MIC's efforts to improve the IT-Telecommunication industry situation in Korea and EUCCK's initiative to inform its members of MIC's efforts are a basis of establishing mutual confidence. Minister Chin said that it is not very easy to convince foreign investors to set up R&D centers in Korea, given that China and India appear more favorable. However, with EUCCK's help, MIC will be able to encourage EU companies to consider Korea as an R&D hub. "There are already many EU companies here, like Phillips, Siemens, and Nokia. Now we will have to encourage them to set up R&D centers, while attracting more ICT companies to come here. The MOU is a step in that direction," he said. Addressing the gathering, Mr. Hampsink noted that the Ministry's IT839 strategy illustrates the government's efforts to make Korea a powerhouse of the global IT industry. At the same time, it is geared toward transforming Korean society into u-Korea, a society where ubiquitous information technology changes the lifestyle of the citizens. "As the representative voice of the 25 country strong EU business community, the EUCCK is keen to cooperate with the MIC in this endeavor. The partnership will be mutually beneficial to both Korea and the EU business community," he said. Both Europe and the Korean Peninsula are strong players in the ICT sector. Nevertheless, both regions have developed their own specialties which can be of benefit to the other side. By drawing on this mutual benefit approach, both regions could turn their cooperation into a win-win situation, improve the IT & Telecom know-how and combine efforts to export to third countries, he said. "For the year 2006, armed with this historic MOU, we will continue with the started activities and intensify the cooperation for R&D in the field of ICT," he said.